These chicken parmesan sliders are loaded with crispy chicken, marinara sauce, and plenty of cheese. It’s an easy yet hearty meal that the whole family will enjoy, the perfect back to school dinner! My kids love sliders. There is something about having hot mini sandwiches that is just fun. Some other sliders that my family loves are Cuban sliders and buffalo chicken sliders. I can hardly believe that it’s time to start thinking about going back to school. Our school starts in less than a month, and while we’ve had an amazing summer, I think my kids will be ready for a more regular routine! For the first time this year, my girls will be in all-day school which means our after school activities will be pushed to later in the afternoon or the evening. 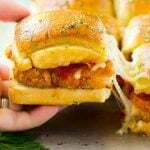 I’m going to need plenty of quick and easy dinner options for busy weeknights and these chicken parmesan sliders will most definitely be on our table! When I’m shopping for ingredients for quick, easy and affordable meals, I head over to Dollar General. 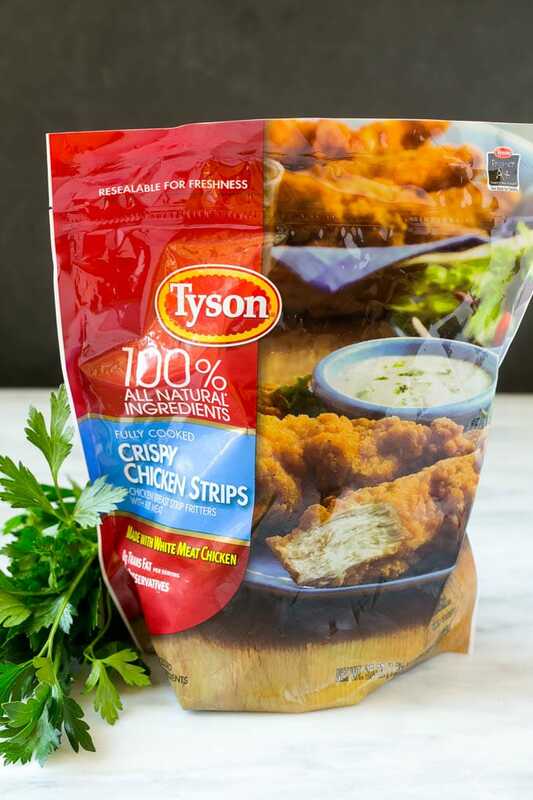 I picked up a bag of Tyson® Crispy Chicken Strips in the Dollar General freezer section, they are SO convenient to have on hand for easy meals. How Do You Make Chicken Parmesan Sliders? 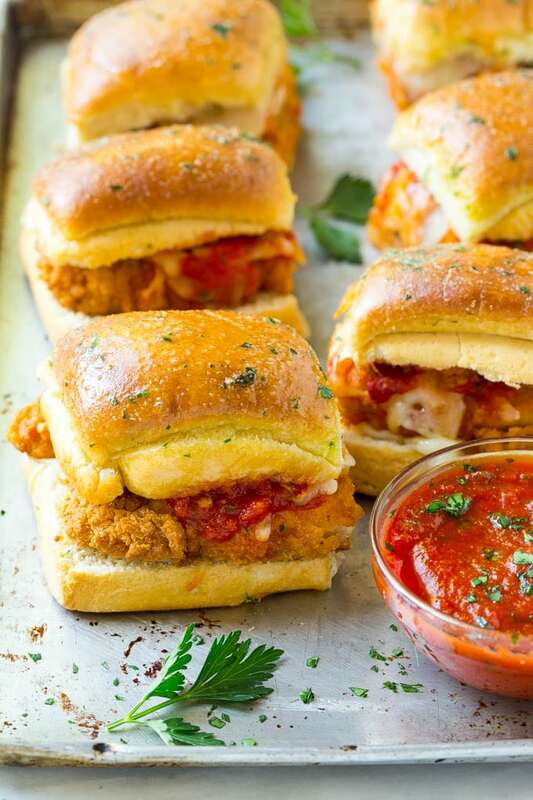 These chicken parmesan sliders start with rolls. I use white pull-apart style dinner rolls. 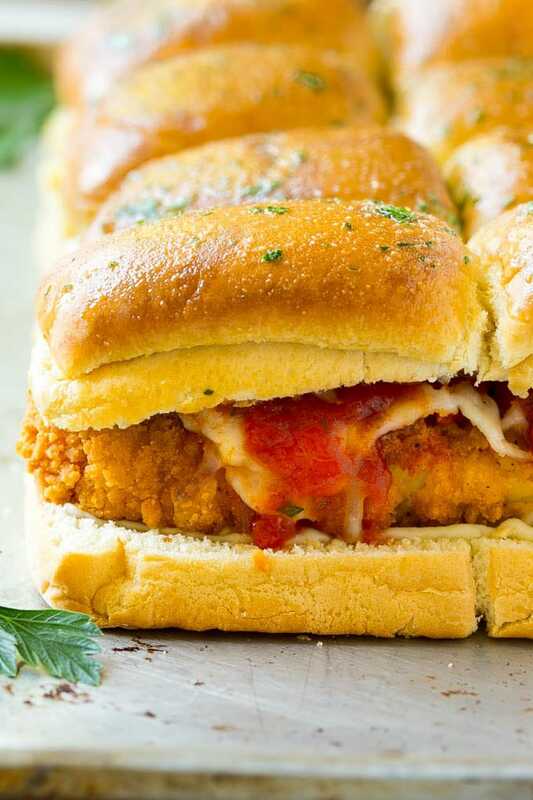 The rolls are layered with shredded mozzarella cheese, cooked Tyson Crispy Chicken Strips, marinara sauce, more cheese (mozzarella and parmesan), and then brushed with herb butter and baked to perfection. I typically shred my own mozzarella and parmesan cheese for this recipe, but if you’re really pressed for time, grab a bag of any type of Italian-style shredded cheese to make dinner prep go even faster. What I love most about these chicken parmesan sliders is that they’re such a hearty meal with plenty of protein. Add a side salad and you’ve got a complete dinner! 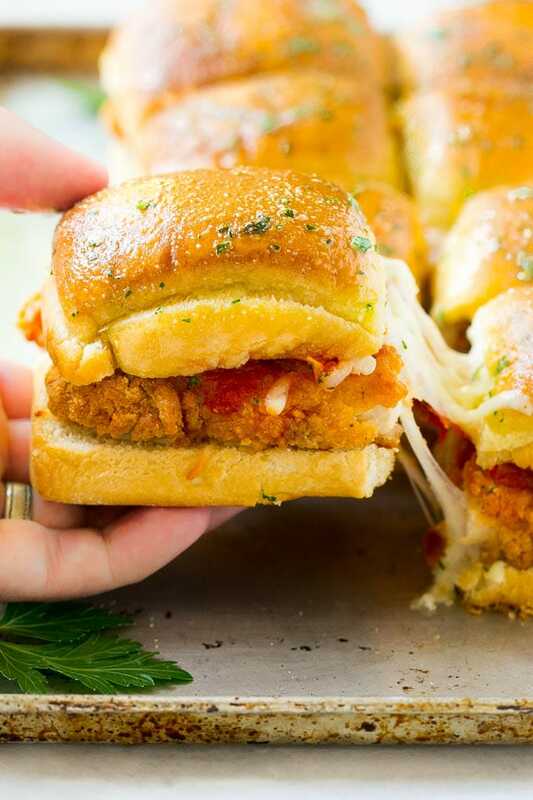 These chicken parmesan sliders are loaded with crispy chicken, marinara sauce, and plenty of cheese. It's an easy yet hearty meal that the whole family will enjoy, the perfect back to school dinner! Cook Tyson Crispy Chicken Strips according to package directions, then turn the oven on to 375 degrees. Cut the rolls crosswise. Sprinkle 1 cup of mozzarella cheese over the bottom of the rolls. 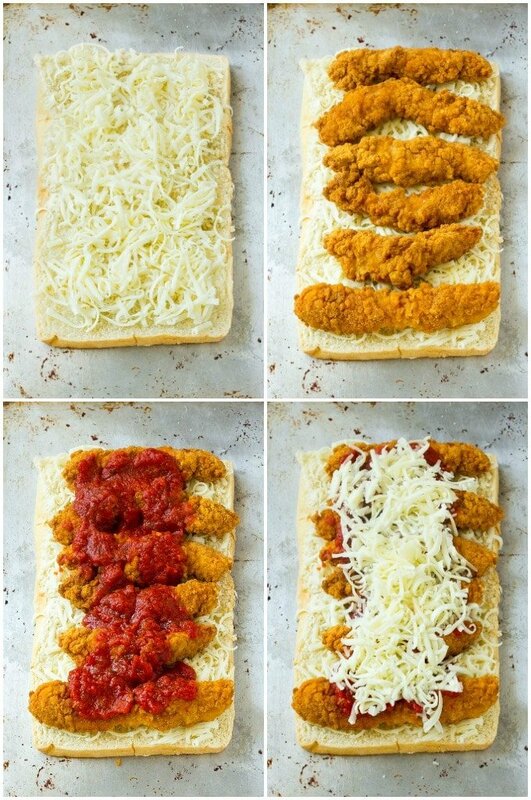 Arrange the chicken strips on top of the cheese. Spread the marinara sauce over the top of the chicken fingers. Sprinkle the remaining cup of mozzarella cheese plus the parmesan cheese over the layer of sauce. Place the other half of the buns on top. In a small bowl mix together the butter, garlic powder, onion powder and parsley. Brush the butter mixture over the top of the rolls. Bake for 15 minutes or until tops of rolls are browned and cheese is melted. Cut the sandwiches apart and serve immediately. This is a sponsored conversation written by me on behalf of Tyson Foods, Inc. & Jimmy Dean. The opinions and text are all mine. Perfect for a game day celebration! Made these tonight. Unfortunately 15 min at 375 ended up burning the rolls a bit, BUT they still tasted fantastoc (after you got past the slightly burnt part). Will absolutely be making these again and again. My husband loved them. Thanks for a great recipe! My favorite back to school recipe is definitely breakfast tacos. My family loves taco ring. Breaded chicken with dipping sauces and mac n cheese. One of my favorite back to school dinner is sloppy joes and mc n’ cheese! boy those look good.i’m going to make them this week. These would be perfect for my husband and I! Going back to cooking for two has been hard. This would make a wonderful dinner and I could either freeze them or have for lunch the next day! Spaghetti is my go-to fast and easy dinner. A tomato and cucumber salad with chicken tenders and rice – easy to make and everyone loves it. lentil sloppy joes. super quick to whip up. Our favorite back to school easy meal is Brinner (breakfast for dinner). 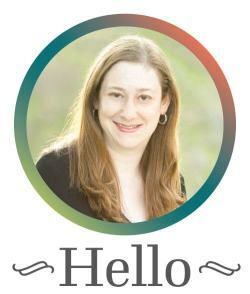 We usually go for French toast made with Challah, fresh fruit and home fries.